Potato Chips? Coca Cola? Stainless Steel? Pacemakers? Some of the greatest inventions we know have been formed by completely accidental geniuses… and polyethylene is no exception to this! First coined polymethylene, German chemist Hans von Pechmann accidentally created the white, waxy substance in 1898 whilst investigating diazomethane. But it wasn’t until many years later again that the first industrially practical polyethylene was discovered. In 1935, Michael Perrin developed a process to reproduce results formed two years earlier (accidentally again!) by Imperial Chemical Industries workers, Eric Fawcett and Reginald Gibson, creating a reproducible high-pressure synthesis for polyethylene, forming the basis for industrial LDPE (low density polyethylene). 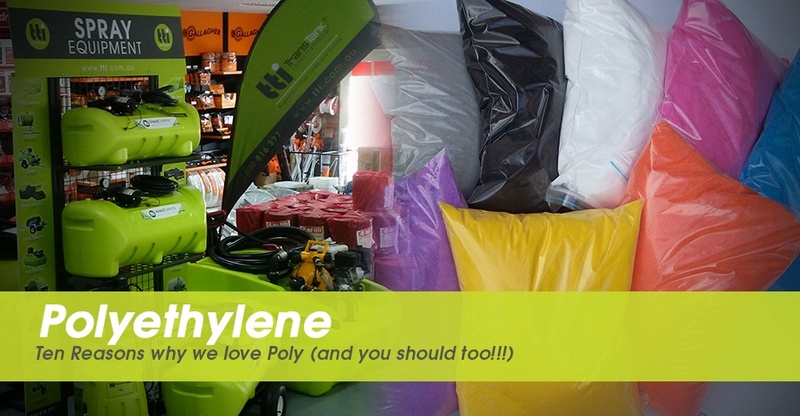 Like many other accidental creations, we LOVE our polyethylene. Most types of polyethylene have high chemical resistance, meaning they are not attacked by strong acids or strong bases. It also offers the advantage of moisture-vapour and electrical resistance. For more information on chemical compatibility, check out our handy cheat sheet below! You’re probably using it every day without noticing! Unlike some other types of tanks, polyethylene tanks are moisture-vapour resistant, and therefore rust and corrosion free. Even when exposed to weathering, salt water and harsh chemicals, polyethylene still stands strong! Slip, slop, slap and UV stabilise! UV stabilisers are often used in plastics to prevent long-term effects of ultraviolet exposure. When it comes to polyethylene tanks, it is important to note that whilst your tank may be protected from sunlight, the content of your tank is not! TTi recommends using opaque colours for water storage, to prevent algae growth. In 1953, German Karl Zeigler developed the newer linear process for manufacturing polyethylene. As the process was refined, some companies were left with such an excess of poly pipe that they faced economic disaster! In 1958, Wham-O-Toy Company solved the crisis by creating the Hula-Hoop, rapidly using all redundant poly stock in warehouses across the globe. So, next time you’re wrapping your children’s lunch up, or watering the garden, or using a tank to cart water, or even Hula-Hooping, remember the poly advantage!